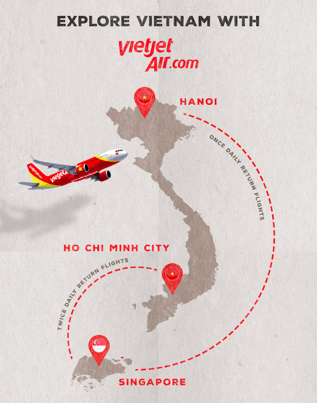 In celebration of Vietjet’s latest route connecting Singapore and Hanoi, the airline is excited to announce a three-day promotion, where millions of promotional tickets will be up for grabs from as little as $0. Tickets will be available from 9 May until 11 May between the promotional hours of 1.00pm – 3.00pm (local time). Travel time applies from 1 August to 31 December, 2017. The promotion also applies to all international routes from Vietnam to Seoul and Busan (South Korea), Hong Kong, Kaohsiung, Taipei, Taichung and Tainan (Taiwan), Singapore, Bangkok (Thailand), Kuala Lumpur (Malaysia), Yangon (Myanmar) and Siem Reap (Cambodia).